Q: Can I add a Google Analytics ID to the online flash flip book? 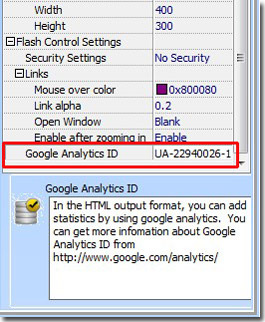 A Google Analytics ID could bring much convenience to website statistic and analysis. When I convert my flash flip book as HTML output type, I want to add a Google Analytics ID to it. How can I make it with the PDF to FlashBook Standard? All the flip book makers we provide have provided this feature to users. Just follow the below tips to get some help. Find the “Google Analytics ID” bar in the last of the right Design Setting panel. Fill in your Google analytics ID in the blank and then apply change. It is available for flash flip book in HTML format.